This shift is undercutting America’s long-term security and prosperity as rivals seek to fill the geopolitical vacuum. 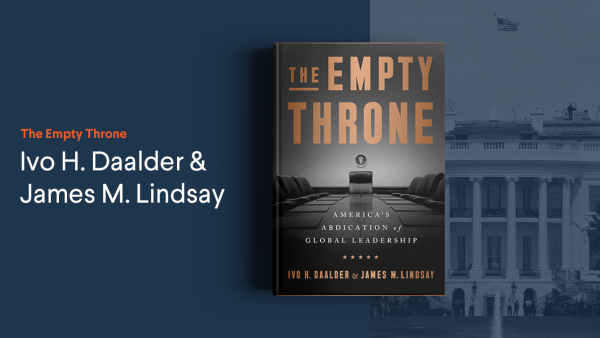 Ivo H. Daalder and James M. Lindsay present their new book, The Empty Throne: America’s Abdication of Global Leadership, which argues that the world order the United States created and led for seven decades was fraying when Donald J. Trump took office. Convinced that the order is the source of America’s problems and not a solution to them, the president has pursued a more nationalist and protectionist foreign policy. 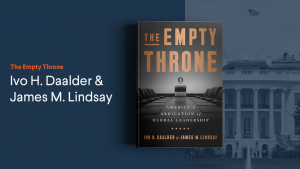 Daalder and Lindsay contend that this shift is undercutting America’s long-term security and prosperity as rivals seek to fill the geopolitical vacuum created by America’s retreat and friends and allies increasingly work without and against the United States. Daalder and Lindsay conclude that while time is short, opportunities still exist to reinvigorate American leadership and save the fracturing postwar order. LIASSON: I’m Mara Liasson from National Public Radio. And I want to welcome you all to today’s Council on Foreign Relations Fellows Book Launch Series event. 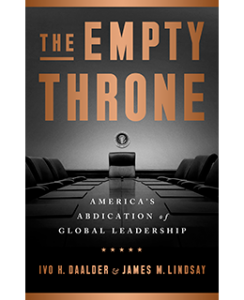 The book is The Empty Throne—and I’m assuming you’ve all bought it—America’s Abdication of Global Leadership. You can still buy it. And I’m going to preside over today’s discussion. And I am going to briefly introduce the co-authors. You probably have their bios. Ivo Daalder, president of the Chicago Council on Global Affairs. He was the U.S. ambassador to NATO. He was a senior fellow on foreign policy studies at the Brookings Institution. And he’s had a long and distinguished career that you can read about. We don’t want to waste our time talking about it. Jim Lindsay is the senior vice president and director of studies and the Maurice Greenberg chair at—here at CFR. He oversees the work of more than six dozen fellows in the David Rockefeller Studies Program. 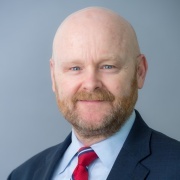 And before he came back to CFR in 2009, he was the inaugural director of the Robert Strauss Center for International Security and Law at the University of Texas in Austin. And what we’re going to do is talk for about twenty minutes, and then we’ll have questions. And I just want to start by saying this book couldn’t have been more timely—urgent, even. And the big question that I always had as a journalist covering the Trump administration was whether Trump was different in degree or kind. Because, in some ways, at least in some areas of domestic policy, he’s just a ruder, cruder conservative Republican. But where he really is different in kind is what you’ve written this book about, rejecting seventy years of U.S. leadership of the rules-based, values-based world order which, for all its shortcomings, did create a very long period of peace and prosperity. So I want to start out by asking both of you: Nature abhors a vacuum. And what are the real-world consequences of America abdicating its leadership role? What’s happened in the world since Trump was elected and decided that American leadership was really a crummy deal for us? LINDSAY: D goes before L.
DAALDER: D goes—(laughs)—that’s why I only write with people whose name comes after me in the alphabet. (Laughter.) Even if they have another D—can’t beat D-A-A. LIASSON: He’s not—you’ve got a lock on that. DAALDER: Well, thanks—(laughs)—thanks so much for presiding. And it’s an important question. It’s a very important question about what the vacuum is, and how it can be filled. There’s a bad news story and there’s a good news story. The bad news story is it gets filled by people who don’t share our values, who don’t share the appreciation of the rules-based order, and who want to do something different. And we’re already seeing that emerging, and particularly with regard to China. And, to some extent, with regard to Russia, particularly in the Middle East. As the U.S. withdraws, as it does—as it’s not involved in building coalitions and bringing people together to deal with global challenges, people are going to turn to others. And the Chinese, in particular, are demonstrating a capacity of filling the vacuum, of bringing others along—whether they do it through force, or money, or buying them off, or by fear that they may be left behind. They’re filling the vacuum. You saw that in particular with TPP, the Trans-Pacific Partnership, where the president walked out of that agreement on his third day in office. After all, he spent a lot of time studying it in those three days—(laughter)—and decided that that was the right thing to do. And the Chinese took advantage of that and made their alternative trade agreement a higher priority. That’s one thing. That’s the bad people, the bad news filling the vacuum. And the other is that perhaps our friends and allies will start filling the vacuum. And TPP has that as a second sort of story, because rather than the Japanese, and the Australians, and the Canadians, and the Mexicans, and others saying: Oh, if the U.S. is not there we’re not going to be part of it. They said, no, if the U.S. doesn’t want to be that’s their loss. Not our gain, but it’s their loss. And we are going to continue together to figure out whether we can maintain at least some semblance of this trading regime. And they’re filling the gap. So the hope here is that, one, the vacuum doesn’t stay very long. But, two, that if the vacuum does stay for a while that not only the Chinese and others who want to fill the gap will do so to their advantage, but maybe that some of our allies would step up and take on greater responsibility, which they should now be more capable of than when this rules-based order was created some seventy years ago. LIASSON: Well, Jim, assuming the vacuum is eight years, not four, is there a silver lining? In other words, the Europeans should step up and do more for their own defense. You know, Europe should be less dependent on us. Is that possible, or not? LINDSAY: It is certainly possible. But as we all know, what countries should do isn’t necessarily what they will do or do do. I actually sort of want to go back to where Ivo left off. There’s another possibility with this vacuum that is created, in that no country is able to fill it and that you end up returning to a world of great power competition. That’s of concern, because the reason Presidents Roosevelt, Truman, Eisenhower worked to create what we call the rules-based or liberal international order was to prevent a return to precisely that world of geopolitical competition, of dog-eat-dog geopolitics. The founding generation—Dean Acheson talked about being present at the creation. He was Truman’s secretary of state. That generation had lived through World War II, but also World War I. And that had left them with the recognition that if we were left with great power politics, unbridled competition, that what you were likely to get is what Europe, in fact, got not once but twice during the 20th century—devastating wars. And the notion of American leadership sprang from that cold-blooded calculation. The United States took the view, and correctly so, that America’s security and its values were intimately tied to the security of others. And that what the United States should do is to lead its friend and allies in solving common problems. And that intuition, that if we helped others do well we would do well also, was proved right over the past seventy years. And it’s that leadership we talk about in the book. And it’s that leadership which has underscored, undergirded American security and prosperity. And it is what is at stake today. LIASSON: Well, let me offer the counternarrative, which is that Trump’s bark is worse than his bite. Yes, he pulled out of Paris, and TPP, and the Iran Deal. But he hasn’t pulled out of NATO. He hasn’t blown up the WTO. The new NAFTA kind of looks a lot like the old NAFTA, with some TPP mixed in. So is it just rhetoric that’s destabilizing? Or has he really done a lot of damage? DAALDER: So there are two parts to that answer. One part is, it’s only been eighteen months. Who knows what’s going to happen in the next twenty-four-plus. DAALDER: Well, it’s actually more than eighteen months, so. We weren’t really—we weren’t really expecting the United States to withdraw from the INF Treaty. And the president decided over the weekend that that’s probably a good idea. And apparently, didn’t tell our allies that that’s what he was going to do, but that’s what he is going to do. LIASSON: Unless you think that’s just a threat, like threatening to terminate NAFTA. I don’t know. I think the second piece, which is important, is that—take NAFTA—the process by which he goes through that, by threatening to withdraw from a treaty, by going after—and the very strong language he’s using against the Mexicans, which he did during the campaign and continued to do as president—against the Canadians. What have they ever done wrong to us, by the way, the Canadians? It’s creating—it’s creating a climate of distrust and creating a sense among our allies and friends that, you know, maybe we can’t rely on the United States. Maybe we can’t really work with the United States. Maybe we need to find alternatives to the United States. The Canadians have now created a Department of Trade Diversification. Why would you do that, unless you think it’s important no longer to rely as strongly and heavily on the United States as you’ve done before? So it’s the—even if the end result is no terrible change from what it was before, the process by which you get there, that is deeply destructive of your ability to lead. And leading is all about getting people to follow. It doesn’t matter who’s in the driver’s seat, it matters who’s in the backseat in order for you to find the way where you want to go. And less and less people are willing to follow. And that’s a problem. It’s a problem for us and it’s a problem for them. LIASSON: Is there an example where we wanted people to follow us and they aren’t now? LINDSAY: Well, I assume the Trump administration wanted the world to follow it on its decision to move the U.S. embassy to Jerusalem. The world has not. I’ll note that in your question, Mara, there were a lot of yes’s. Trump has done this, yes, but. And I think one of the problems we have is everybody wants the cost of the decision to manifest themselves immediately. The world doesn’t work that way. Decisions have a long shadow. And it may be years before you get the actual bill. And let’s go back and talk about some of these trade deals. OK, yes, the president got deals. He got a deal with Korea to revise the U.S.-Korea Free Trade Agreement, known as KORUS. He got a revision to NAFTA. We got a temporary truce in a trade war with Europe. As you look at these deals, you have to ask yourself, not did you get a good—a deal, but did you get a good deal? And what price did you pay for it? And I think when you hold up the president’s agreement to the light of day, they don’t fare very well. Let’s take KORUS. With the case of KORUS we got a revision in which the United States—the changes were exceptionally modest. One of the changes was doubling the quota on the number of cars that American manufacturers can sell into the Korean market. We doubled it. The only problem was, no American automobile manufacturer hits the current quota. Or let’s look at NAFTA. You noted that NAFTA has a lot of TPP. So we’ve had a negotiation with the Canadians and the Mexicans where we have created a lot of upset, the Canadians are now trying to find ways to sell their products to people other than the United States, to get a trade deal that looks a lot like one we had when the president entered into office because NAFTA was functionally renegotiated under TPP, because Mexico and Canada were part of the Trans-Pacific Partnership. And when you look at the new NAFTA deal, I guess it’s USMCA—I won’t sing it for you—OK, if you look at it, sort of what’s new in it from the Trump administration actually makes trade less free and open. What’s really interesting, for an administration that has prided itself for slashing regulations across the board for business, they’ve upped the level of regulation in terms of auto content, making it harder for companies. They’re going to have to be able to track all of this. I would suggest over the long term that’s going to make American automobile manufactures less, not more, competitive in what is a very tough international market. LIASSON: Let me ask you about Trump’s isolationism and its effect on politics. I’m particularly interested if you think he’s a party of one. In other words, we’ve seen Congress, his own Republican Party, push back on NATO. They passed that resolution before he went to the NATO meeting. They passed Russian sanctions unanimously. You have top administration officials, like Mattis and Pence, kind of going around the world to tell our—practically blinking in Morse Code to our NATO allies: Don’t listen to him. We’re still committed. (Laughter.) So my question is, has he—do you think he will succeed in changing the Republican Party permanently on this into an isolationist, protectionist, America-first party? Or can they ever go back to the previous—their previous definition of American leadership? LINDSAY: Well, what is it that Yogi Berra says about predictions? They’re hard to make? LIASSON: Right, they’re hard to—especially about the future. Very hard to make, especially about the future. Yeah. LINDSAY: Especially about the future. So I’m a little bit reluctant. But I do think that he is changing the Republican Party. But I wouldn’t describe it necessarily as changing the Republican Party and taking it in an isolationist direction. When I look at President Trump, and as we talk about in The Empty Throne, President Trump certainly hit upon isolationist themes during the course of the 2016 campaign. But when he talked about foreign policy, he didn’t talk about it, let’s say, the way that Senator Rand Paul of Kentucky, who clearly is an isolationist—wants American to come home, wants a smaller footprint. The message that President Trump had was: I’m willing to stay abroad if you’re willing to pay me for it. And he tended to sort of transform America’s alliance relationships not in terms of we do it because it’s in America’s interest to do so, but we do it because we should get paid for it. LIASSON: Like a protection racket? LINDSAY: Well, those are your words. I won’t use them. (Laughter.) But in essence, the president isn’t talking about coming home. Indeed, the whole issue with NATO wasn’t NATO’s going to spend more so Americans can spend less. It was Americans are going to spend more and NATO should as well. So I wouldn’t describe it quite as isolationist. But it’s quite clear, certainly on trade, that I think a big chunk of the Republican Party and the Republican congressional leadership is rethinking its traditional support for opening up markets. Again, the traditional American approach has been to get American products into other markets. The distinctive thing about President Trump is he wants to emphasize keeping foreign products out of the American market. DAALDER: And also, I’d sort of—he is a—he is the only one in charge. It’s clear that there are lots of people in the administration who don’t agree with him on issues like NATO, on issues like trade, on issues like leadership and alliances. They still use that. But it doesn’t really matter. In our system, when the president decides, this is what we’re going to do, that’s what we do. And I think Rex Tillerson, and H.R. McMaster, and Gary Cohn found out what it meant if the president wants to go in a different direction than they want to go. They either get fired or they leave. And so you can’t underestimate the importance of the president, who is increasingly confident in his view about how to conduct the presidency. If you compare sort of the interviews that he does today to the ones he did fifteen, sixteen, seventeen months ago, this is a supremely self-confident person who thinks he’s got it. He knows how to be president. I think that was the most noteworthy thing with the Lesley Stahl interview on 60 Minutes. Was this sense I’m the president. I know how to do this. And go away. And my sense is, that’s how the staff is dealing with it. And so he’s going to be there. And he’s going to be in charge. And he’s pretty much going to do it the way he wants to do it no matter what Mike Pence tells him to do. LIASSON: (Laughs.) Well, let me ask you whether you think he’s out of step with the American people because you do a lot of polling. And we’ve seen support. What did you say the other day, he’s made globalism great again? I mean, you’ve seen support for trade go up, and immigration go up, and American leadership in the world go up. I don’t know if you’ve done any polling among young people, but what about public opinion? Are they Trumpist? DAALDER: So in the Chicago Council on Global Affairs, I’ve been doing polls since 1974. We did one again this summer. Jim is part of our advisory group. And internationalism is back, for reasons that may or may not have to do with Trump. You don’t really know the cause of effect. But there is more support for a strong American role in the world than there has been since 1974, with the exception of immediately after 9/11. There is more support for trade. There is more support for alliances. There is more support for Paris and—agreement, and the Iran agreement, and for supporting our allies overseas than we have seen in a very, very long time. So it’s kind of like oxygen. You don’t really know it’s there until it’s no longer there. You don’t miss it until it’s no longer there. LIASSON: As long as it doesn’t have Trump’s name on it, they’re—yeah. DAALDER: So Republicans are pro-free trade. I mean, even those who have a very favorable view of Donald Trump—a majority of those think that NAFTA was a good agreement. So there is a disconnect between what the public thinks on these issues and what the president is doing. LIASSON: So, Jim, does that suggest that this could be reversed? LINDSAY: Including among Republicans. The idea that Trump has been good for internationalism. But let’s look abroad. And I think, you know, one of the concerns I would have is ether that others will give up on us, or they will come away with a very different vision of who they think we are than we think we are. I don’t think Americans should ever underestimate how much political capital they built up around the world because the United States defeated Nazi Germany and stood up to the Soviet Union. People didn’t forget that. Over the course of this rule-based order—it wasn’t an idyllic place. It was never the case that the United States always got it right. The United States made big mistakes. Think Vietnam. Think Iraq. When we made those mistakes, they weren’t required by the demands of global leadership. If anything, our friends and allies said: Don’t do that. I’m old enough to recall when people went in the streets and poured really good French red wine into the gutter to protest the fact that the French opposed the U.S. invasion of Iraq—a position many Americans have now come around to, unfortunately far too late. My worry is that for more and more people—fewer and fewer people around the world were born in the shadow of World War II or the Cold War, and many more people, born at a time when their image of America is crafted by or shaped by the Iraq War, rising hostility toward immigrants, a sub-prime mortgage crisis that nearly brought down the international financial system, and a government that—we haven’t talked about this so far—an administration that is turning a blind eye to obvious human rights violations around the world, most notably but not solely the murder of Jamal Khashoggi. LIASSON: And that’s where I was going to—I want to ask one last question before we open it up for questions from the audience. OK. For Khashoggi, is this what the Saudis have always done with impunity, only worse? Or is this different in kind? Is this what happens when the throne is empty? DAALDER: Well, I mean, it clearly is the case that the president decided that the first visit he would make as president was to Saudi Arabia. The first time a president hasn’t gone to either Mexico or Canada as the first trip. In fact, we had fights with Mexico and Canada and then went to Saudi Arabia. It was a trip in which he told them he wouldn’t lecture them on human rights. And he then subsequently stood by when they blockaded Qatar. In fact, he supported that, even though his minister—secretary of defense and secretary of state didn’t. He stood by when the crown prince imprisoned hundreds of businessmen and royals. He stood by when they kidnapped the Lebanese prime minister. He stood by when a tweet by the Canadian foreign minister resulted in the breaking off of a relationship with Canada. And so it wasn’t a strange calculation on the part of the Saudi regime to think that they could—that the U.S. would stand by if they murdered some dissident journalist and get away with murder, literally in this case. And so in that sense, you can’t draw a direct line, but there was no reason to think that the crown prince, who has gotten away with everything he’s done up to this point, wouldn’t be able to get away with that, because after all he had the direct line to the White House. They didn’t have to talk to the State Department because they knew that they could talk to the president or his son in law, and they would get stuff done. Now, it doesn’t mean the president or his son in law is responsible for the murder of this journalist. The Saudis are responsible for it, and they’re the only ones who are responsible for it. But it does mean that you have to think through strategically the consequences of your actions. And particularly when the United States—when the United States is silent about human rights abuses or, worse, when the United States says that the press is the enemy of the people, when the United States goes and one dictator after another is embraced in one form or another—I mean, remember, the Saudis, the Russians, and the North Koreans have all killed people abroad. And Vladimir Putin, Mohammad Bin Salman, and Kim Jong-un are now great friends of the president of the United States. What’s the message that we are sending? Even if that’s not the intent, that’s the reality. LIASSON: Yeah. Now I’d like to invite our members to join the conversation. A couple reminders. Everything that’s said in this room is on the record. So behave yourselves. LIASSON: You’ll be given a microphone. You should stand up and state your name and affiliation, and please only ask one question at a time. Q: Good evening. Thank you for a fascinating discussion. Esther Brimmer, NAFSA, the Association of International Educators. Looking forward to reading the book. Where do we begin to repair the situation? Do we start with our alliances? How do we rebuild sometime in the 2020s? LINDSAY: Well, that is an excellent question. I think we have to do a lot of repair. But let me sort of take a step back. I think one of the things we have to keep in mind is that this rules-based order has been in need of repair for quite some time. And Donald Trump when he became president was fond of telling people that he had inherited a mess on foreign policy. And I can certainly understand why. After seventy years, the rules-based order had been showing its age. The United States had made some disastrous foreign policy decisions—Iraq, most notably. And the rules-based order was in trouble for a couple of reasons. One is you have countries, think Russia, that never accepted this idea, and wanted to go back to this geopolitical competition, with spheres of interest where they would get to throw their weight around. Oddly enough, rules-based order is in trouble precisely because it did what it was supposed to do. It make countries more wealthy. It made countries freer. And one of the things we saw is that power got distributed. It was no longer the case that the United States by itself dominated it. It created a whole new series of problems. Yes, we have got globalization. We got lots of problems that didn’t stay home and went across borders. We had a lot of international institutions that couldn’t adapt. And then finally, the United States did a variety of things, I mentioned Iraq and the mortgage-based financial crisis, that really cast judgement on the wisdom and judgement of U.S. policymakers. So part of what we have to do is to get our friends to do more. And, again, they are capable of doing it. There’s an awful lot of time, again, talking about how allies—what they can do. I would focus on a lot of things that they’re already doing. Again, Ivo knows this much more than I do, having been U.S. ambassador to NATO. But they are devoting more to defense. If you look at trade, they’re actually trying to address a lot of the concerns that the Trump administration had. One of the interesting thing is even though our friends and allies are willing to join with us, for example, in confronting the very real problem posed by Chinese predatory trade practices, the Trump administration hasn’t really been willing to take them up on it, which creates one of the central ironies of the Trump administration. You have a president who campaigned saying: Our friends are free-riding on our coattails. They’re not doing enough. And now as president, he’s not asking them to do anything. He’s going off and taking the burden all on his shoulders. Rather than seeing force in numbers, he’s trying to do it unilaterally. And I think it means it’s going to make it less effective. I also think part of what has to happen is people who believe in the rules-based order have to get in the habit of explaining to Americans why it works for them. And indeed, that’s part of what we try to do in the book, to explain why some policy prescriptions that sound really good are disastrous. Case in point, tariffs. You know, the argument is, you know, the president’s putting tariffs in place because we’re going to get American workers back to work. Well, everything we know about economics tells us that while tariffs may help you in the short run, they’re going to be costly in the long run. Look, for example, at tariffs on aluminum and steel. You talk to the CEO of Ford Motor Company, what does he tell you? It’s going to cost us a billion dollars. What does that mean? Less money for Ford to invest. Ford’s going to restructure. People get laid off. If you’re an Iowa pork farmer, I’m a big fan of the great state of Iowa having lived there for a dozen years. Iowa pork farmers were looking forward to being able to finally sell their great Iowa pork into the Japanese market because of TPP. The president walked out of TPP. Japanese said, OK, you don’t want to do a deal with us, we’ll do a deal with the European Union. So now those farmers in Polk County can’t sell their pork in Japan at an advantage compared to the Europeans. It’s the Europeans’ Parma ham that’s going to go in and undercut American pork. And that’s why these decisions matter. And part of what we have to do is explain to people how things are connected. Q: Bill Drozdiak, McLarty Associates. To what extent do you think Donald Trump is a symptom, rather than the cause, of this abdication of American global leadership? I mean, you can make the point that Barack Obama talked about free riders. He talked about pivot to Asia. And at the same time, you also have a clear rise of populist nationalism, not just in Europe and the United States, but elsewhere. So is there a historical wave that the two of you discerned in the research that you were doing about this book? DAALDER: I mean, in many ways he’s symptom rather than cause. And he is—he is riding and directing a wave. He’s not—he’s certainly not trying to go the other way, in terms of both populism and nationalism. And I think—let’s not underestimate, and we don’t talk enough about nationalism. What’s really happening in Europe—which, Bill, you know as well as I do, if not better—is an emergence of nationalism, a sense that we need to stand up for the nation. And that’s happening here too. And it has—in many ways, it is the same kind of sentiment that existed in the ’20s and the ’30s, for very different reasons at the time, that is coming back. And the rules-based order was designed with very much knowing in mind that that was one of the tendencies of nations, is to think about nationalism and the comparative advantage of one against the other, as opposed to the comparative advantage of working together to deal with common problems. And as you undermine that rules-based order, nationalist sentiment will rise by definition. It’s kind of how it works. And we know where that ends. It ended in the 1930s—it ended in a terrible way. It was why we decided—wise men—and unfortunately they were all men at that time—decided to create that new system, and to have American leadership be the glue that kept that system together. And to fight against the very tendencies that are always there. They were there in the ’50s. They were there in the ’60s, and the ’70s, and the ’80s. They’ve always been there. But to fight back against it, because we knew what the consequences were. I think what we’re having now is a sense of amnesia. We don’t remember what the ’30s was like. We don’t remember how bad it can be, because, you know, for seventy years we’ve had this extraordinary success of an international system that had no great power wars, in which everybody became more secure, more prosperous, and more free. And we thought that was kind of the natural order of things. And we’re learning, actually, it wasn’t. It required real day-in and day-out activity by far-sighted leaders on both sides of the Atlantic, on both sides of the Pacific, to make it happen. And when the key glue says, basta, “enough,” don’t want to pay for it anymore, it’s going to—it’s a huge challenge to the system. And that’s really what’s happening. LIASSON: Way in the back. Yeah. Q: Thank you. I’m Priscilla Clapp. I’m with the U.S. Institute of Peace. Formerly a Foreign Service officer. DAALDER: So the first one is a lot easier to answer than the second one. (Laughter.) So I’ll leave that to Jim. (Laughter.) It’s a—it’s a—it is a broad, representative sample of the total population. It includes a representative sample of pro-Trump—of his base. A strong percentage. And the remarkable thing—and it doesn’t matter whether you look at trade, alliances, active role, whatever—is the big difference is between Trump supporters and everybody else. That’s where the cleavage is. Now, two points to emphasize. First, and importantly, the American people are not expert on foreign policy. They—so you cannot overestimate the degree to which they know about foreign policy. And they shouldn’t. It’s not what—but don’t underestimate how much they understand. And they do understand very fundamental concepts. And our polling for almost fifty years now, forty-five years, demonstrates that. Second thing is, Americans do not vote on the basis of foreign policy. It’s extraordinary rare. It requires a huge political crisis or foreign policy crisis for foreign policy to play a role. And it plays no role. And if you look at the election campaign, and the ads, and everything else, you know that that’s the case. So just because there is a sentiment publicly that says you can have an internationalist foreign policy, doesn’t mean you can’t win on a platform of protectionism and what Donald Trump has. It does mean, transition to the next question, that there is at least a basis for having an internationalist foreign policy. That shouldn’t mean that you therefore—you don’t have to become protectionist to win an election. You don’t have to be against TPP to win an election. You can be in favor of it if you make the case. You’re just not going to win an election on it. LINDSAY: I just want to sort of chime in here. Advice I once got for a career advice was: Be very careful in who you pick as your predecessor. (Laughter.) And by that standard, I think the next president of the United States could be the luckiest man or woman around. I say that for a couple of reasons. One, there are a lot of our friends and allies who very much hope that America will return to the kind of foreign policy it has pursued over the last seventy years. Even though there were disagreements among Democrats, and Republicans, and within the parties about what should be the right issue to prioritize and what the right tactics were, American leadership was something that resonated around the world. You go back to public opinion polls, you continue to see it. Americans don’t—excuse me—people around the world don’t particularly care for the Trump administration, but if you ask them: Would you prefer to see Russia or China as a global leader rather than the United States? It’s pretty clear the answer is no, they don’t want. The big question, the question that’s hanging over all of this, is who will the next president be, and what will he or she seek to do? If I had a concern, it’s that in Washington, D.C. the conventional wisdom is locked in that the public wants to come home again, that the public is isolationist, that the public is tired of the burdens of global leadership, and that people continue to tell themselves that, and that dictates policy. Ivo is quite right. Americans seldom vote in large numbers for president or members of Congress on foreign policy issues. But what the public does do is it gives the president considerable discretion, considerable move for maneuver to chart a foreign policy. So Ivo is quite right. Whosever campaigning in 2020, I hope they actually channel some of what Donald Trump did in 2016, in the following sense: Trump won, in good part, because he dared to do what the consensus said he couldn’t or shouldn’t do. I hope candidates running in 2020 take on this notion, which I think is wrongheaded, that Americans don’t understand that they have big stakes in the world, that whether they’re going to achieve their security and prosperity is inherently tied to whether or not we can get others to go along with us. I think Americans understand the sense of global responsibility the United States can exercise and should exercise. LIASSON: Yeah, what if he had—somebody had sold TPP as the screw China bill. LINDSAY: Well, but that’s in a sense what—I mean, President Obama, without using those words, portrayed it just that way. Q: Puneet Talwar with Inter Mediate. So I wanted to actually press you a little bit further on that last question and think about what the short list would be for that next president. And you know, taking a—you know, the suggestion that we don’t know what’s going to happen in the next two or six years. But assuming that the general line of policies will be consistent with what we’ve seen to now, what would that short list look like? And I—you know, Jim, I do think that—you know, I don’t think it’s going to be that easy, particularly on trade, I’ll just posit, for a Democratic or even another Republican, traditional Republican president, to, let’s say, unwind the tariffs at the flip of a switch. There will be that gush of goodwill. How should the next president use that? What’s that short list of two, three, four items look like? What would you recommend? DAALDER: So let me—which actually gets back a little bit to Esther’s question. I think we have to understand one thing that President Trump does not understand. In the global competition for ideas and power, we have one advantage over everybody else. We have allies. We have friends. The Russians and the Chinese have clients. It’s very, very different. So the first thing I would do is to figure out, how do you maintain, strengthen, and transform our relationship with allies? And they need to be transformed. President Trump is right that the time for our allies to do more on defense, to carry more of the global burden is—has come. In fact, it’s long been past. By the way, it was President Obama who said: Free riders aggravate me. And it was President Harry S. Truman who said it was time for the Europeans to pay more for defense. (Laughter.) So this is not a new thing. But it is time that more of that burden is taken on. But the one thing that makes us different from everybody else, the one thing that allows us to have a rules-based system is to be leaders of allies and friends. It’s true that the United States is not as powerful as it was—militarily or economically—as it was in 1945. But if you take our allies and add it to what we have, we’re in fact more powerful than we were in 1945. In economic terms, in military terms, and we are in value terms. And so I think number one is understanding how important it is to work with other countries all over the world. And our friends are not just our formal military allies. They’re in—they’re in Africa. They’re in all parts of the world. And make that part of who we are. Spend some time doing diplomacy. It was George Shultz who talked about diplomacy as gardening, and going over to make sure that the weeds weren’t growing over and taking out the plants, and spending time there. How can you do a crisis management in Turkey and Saudi Arabia when you don’t have an ambassador? And it’s not the Democrats in the Senate’s fault, because they can’t confirm an ambassador until that ambassador is nominated, which in the case of Saudi Arabia and Turkey has not happened. So it’s that rebuilding of our central capacity to work with other countries who are on our side that is fundamental to rebuilding our standing in the world. LIASSON: I think we have time—oh. LINDSAY: If I could just jump in very—just very quickly. Puneet, it’s not going to be easy, but when has politics been easy? Politics is a hard business, as you know through your own career. The other thing is, I think it will get easier for an American president to make the case to the American people, to overcome political criticism in terms of pursuing an internationalist foreign policy, if our friends and allies actually do more. And Ivo and I have written, calling on them to do it. Part of they need to do it is because it’s in their interest to do so. And if they do more, they do more that is tangible, that can be seen, it makes it easier for American lawmakers and politicians to make the case to skeptical members of the American public. LIASSON: We have one more. Ma’am. Q: Sara Cook, CBS News. Thank you so much for the fascinating discussion. I’m really interested in the longer-term impacts of this abdication of American role on the world stage, as well as withdrawing from deals, some of which are very longstanding. Does this have a long-term effect on trust in America? And, you know, be it with the Trump administration or down the road, no matter who is president in two or six years? What is the longer-term impact of that? And is that something that can be regained, this trust in American leadership? 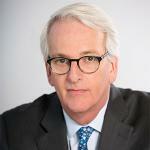 DAALDER: So leadership at its core depends on trust. It’s the core of our ability to get things done. You can get people to do things that they otherwise don’t want to do either by coercion or you do it by trust. And we’ve done it for seventy years on the basis of trust. And that trust is damaged, if not broke. As we know, just as trust-breaking in a marriage is hard to get back together, it’s relatively easy to break it, it’s very difficult to rebuild it. In that sense, the longer this goes on, the more difficult it will be to rebuild the trust. Not only because of the policies of the particular president, but also because if the American people decide they’ve seen it and they like what they saw and they want to do it again, it becomes a little bit more difficult for people to say: It’s not just the president who we have a problem with. It may be part of the country. And that’s a judgement that will come back to haunt the country, this country, down the road. Originally published by the Council on Foreign Relations under the terms a Creative Commons Attribution-NonCommercial-NoDerivatives 4.0 International license.